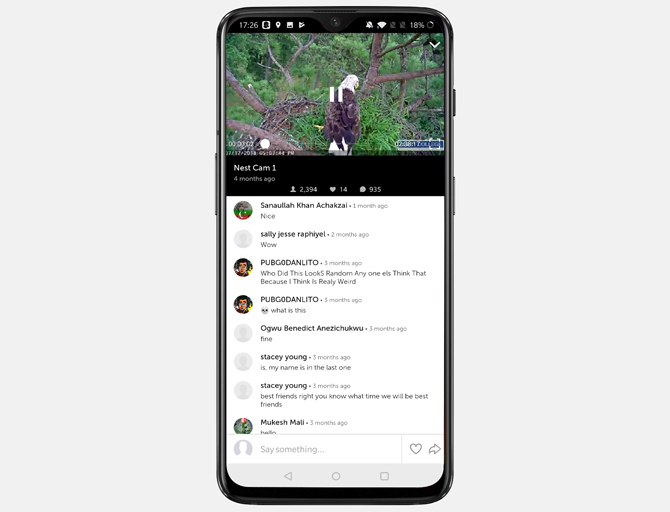 Live streaming is not just limited to big TV networks anymore, with giants like Facebook and YouTube introducing their own live streaming services for the end users, you can now live stream to your friends, colleagues, do a presentation, and reach out to your followers. There are plenty of live streaming services but which is best for you? I have made a list of best live streaming apps for every category. Let’s begin. Instagram is one of the most popular photo-sharing apps and much like other social networking apps, it also allows you to create live broadcasts. Remember the “Going Live”, notification on Instagram? 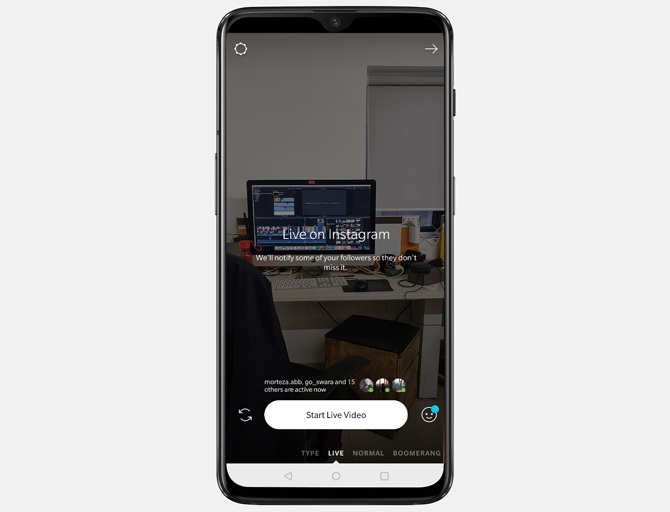 To start the live stream, open the Instagram app and tap on Add story button or swipe right to open the story page and select “Start live video”. And that’s it, Instagram will notify your followers that you’ve started a live stream, with a push notification. Once the live stream is over, you can tap on “End the broadcast”, next it tells you the total number of viewers who watched you live. It also gives you options to save your live stream and share it as an Instagram story for the next 24 hours for those who weren’t able to watch in real-time. The default settings of Instagram stream the video publicly and allow messages from anyone. 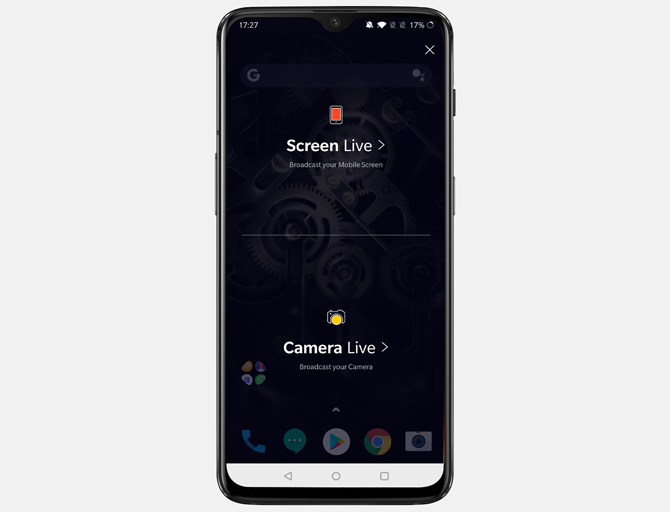 However, if you would like to customize your live session, tap on the gear icon on top left side of the live streaming screen to bring up the Story Settings, here you have options to Hide story from other people, invite friends to join live video sessions etc. Unlike other platforms only your followers can see your live stream. Add other friends to Instagram Live. Unlike Instagram, Facebook Live is available for the web as well as on the official app. The layout is not very different from Instagram but the visibility and audience reach is greater with Facebook live. To go live on Facebook, tap the camera icon on the top left corner in the app and swipe right for the Live option. 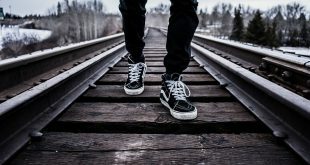 You can add a description for your post and select visibility just like any regular post. Much like Instagram live, you can also add a friend, add mystery masks etc. Once you’re done with this tap the start Live video button to go live. When you end your live stream, you can post the video as your story for 24 hours or post it to your timeline or both. Facebook live is not just about streaming content its also helps the user generate an audience and gain insights about their broadcast. Much like Facebook, YouTube live streaming is available for both web and smartphones. But unlike Facebook, you need to verify your phone number and make sure your channel has “good standing” before you qualify for live streaming on YouTube. To go live on YouTube, open the app and tap the upstream icon on the top right, and select Go Live. If you’re doing it for the first time it would ask your phone number to verify your account. 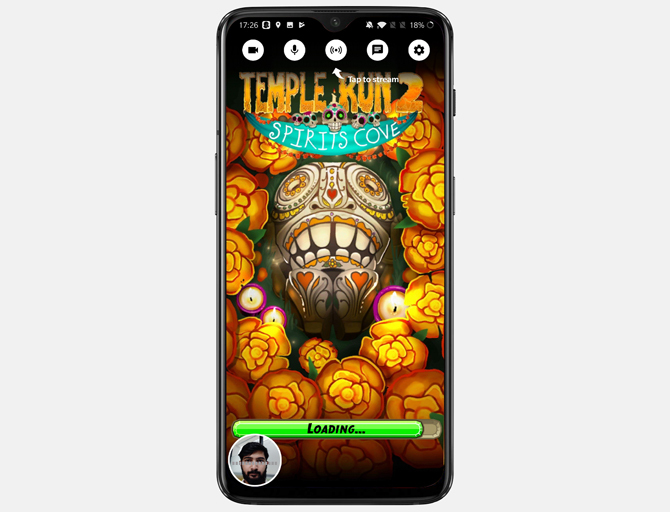 After finishing the verification, it takes you to the app dialog, you can select the game of your choice and press next. You can share the streaming link to Facebook and proceed to live stream window. You can toggle the camera to show or hide your face in the live stream, mute mic, and disable comments. There is also a YouTube gaming app that supports live streaming targeted to gamers. All of your live streams are added to your account once the streaming is finished. You can review your videos in your youtube account’s video manager and change their visibility. Owned by Twitter, Periscope is a live streaming app which allows you to share live content based on interests, geographical location, and trending page. Not only you can use the front and back camera of your smartphone but external devices like Go Pro as well. You can start by creating an account or sign in using your existing social media credentials. Tap on the live button on the bottom right and select visibility of your live feed, add a title and go Live. It’s that simple. You can create a group of specific members and keep the live stream exclusive or broadcast to the general public. 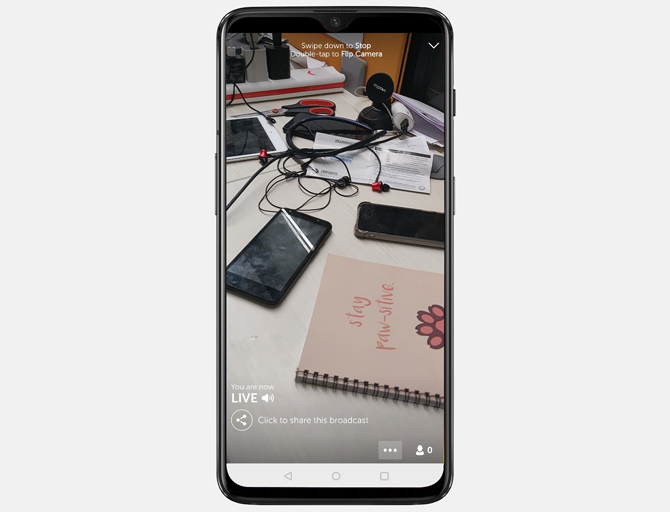 People can watch your live stream on the periscope app or you can connect your twitter account and stream it to your followers on twitter as well. Once the feed is complete you can see stats like total time watched, time watched/ viewer, duration, starts, etc. You can also set moderators who would maintain decorum in the chat room and mute viewers from abusing the chat feature. You can save the live stream to your gallery after it has finished. This app is great for people who wish to talk about and showcase their talents to interested people. Livestream focuses more on niche content across the web and live events. You can search popular broadcasts or browse by categories. It has content ranging from animals, lifestyle, music, and sports to politics. 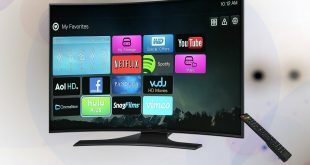 Streaming live events from the app to your chromecast, Roku and Apple TV add another perk. You can follow popular channels and independent broadcasters. You can stream to Facebook, Twitter, Livestream or any other platform from your mobile. It does not have any in-app ads and that is great but the only downside to this is the subscription price. It costs $75/mo which is quite steep for independent and budding creators. 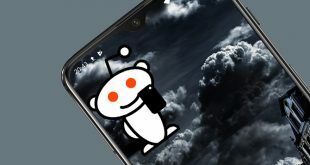 I would recommend using it when you have a budget and you’re looking for a bigger platform. But you get a $500 camera with the subscription that counts for something, right? Mobizen uses the YouTube API to offer a rather seamless experience. You just log in with a Google account and stream with this app. You would also have to verify your account with YouTube if you’re using it for the first time. The reason I included this app as it does not stress the hardware with its non-existent UI and offer a smooth live stream experience. To go live with Mobizen Live, tap the app icon to load the floating icon. tapping it gives you two options, either to stream your mobile screen or your camera. Once you select one option, it gives you a sharing link to share the live stream on other platforms. And then you go live on youtube as you press Start. This app is best for anyone who wants a quick app to broadcast their feed on to youtube from their mobile. Although the app is free you do get ads when you go to the video manager which is not so much of a hassle. Ustream is a streaming service offered by IBM which offers users a broadcasting platform with a massive following. You can watch popular broadcasts run by users or create your own channel. 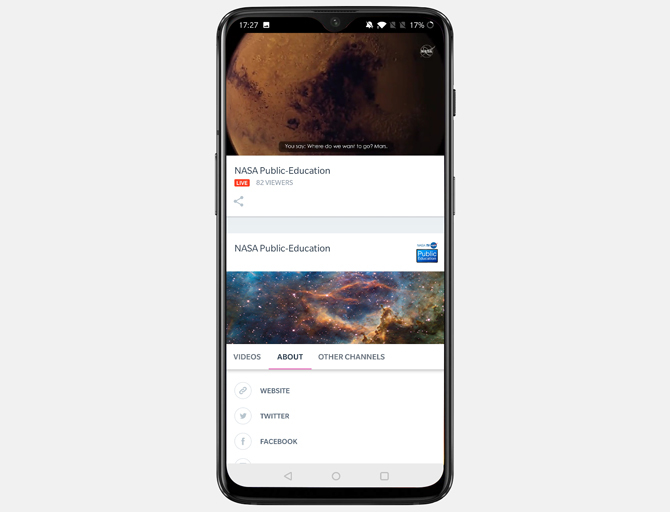 You can watch educational streams like NASA and ISS live stream with this app. It also allows you to stream saved videos on your phone. 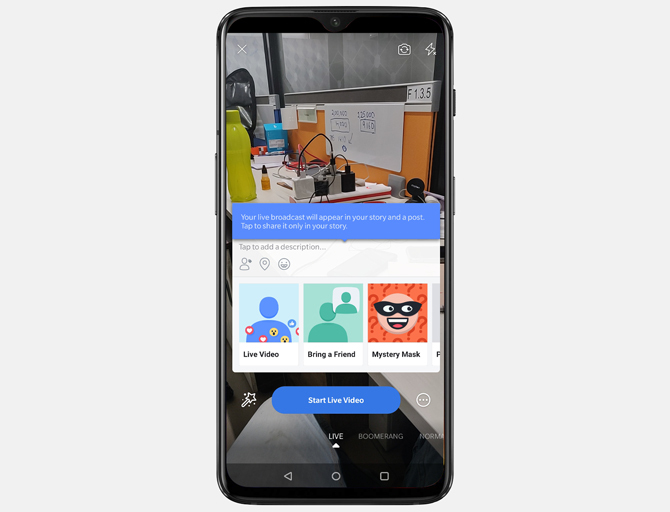 You need to create an account to be able to broadcast your video feed, however, I was testing the app for this article and I was unable to create an account as the app is in a transition stage and they’re moving from their legacy software to updated technology. As the transition is completed you would see a new version of the app with new features. Twitch is the most popular streaming service which offers live gaming content along with videos and clips. It also showcases eSports, music broadcasts, and creative content on its platform. You can stream your content under categories like art, food & drink, science & Tech, podcasts etc. To stream on Twitch, tap your profile icon on the top right, then tap Go Live button, enter the description and category of the stream, and press start stream. With the mobile app, you can stream your content but only in landscape. You can hide the chat, mute, and lock screen while streaming. You can share the content to other platforms after it has broadcast but not during which can be a downside for some people. Which are the Best Live Streaming Apps? Live streaming on mobiles has never been easier and you get so many options now. Instagram is a more personalized live stream while Facebook can be used for more professional use. YouTube gaming and Twitch are the most popular gaming live streaming services. Mobizen, however, does use YouTube API but offers a simple one-tap solution to streaming. Tell us which is your favorite live streaming service for Android in the comments below.